It’s early morning and I have spent the last 10 minutes admiring the light and shadows on a small brave bush somewhere alongside the road to Furnace Creek in Death Valley, a place my husband and I have come to de-stress and transition into the new year. This is a mystical place that has long inspired artists and awe. Driving through the valley’s lunar landscape, we find ourselves slowly banishing thoughts of schedules, appointments and deadlines. What seemed like an impending crisis back home now feels like a ridiculously insignificant issue in the grandness of this other-worldly moonscape. “Oh goody,” I say, as I send one more of these annoyances out into the universe. As our spirits settle down, I begin to feel the presence of the far reaching horizon, the shifting light and above all, the overarching silence of the desert sending back its love. There is an earth aura here that, on many levels, defines infinity. Once more, I pay attention to the light on my little bush. I notice the play of shadows as the clouds shift. Ahead, sunlight illuminates the flanks of the mountains as it dances across them. Winter clouds gather. Patterns emerge and disappear as the light moves through space. This is why I have come here. Death Valley is working its magic. One of the desert’s earliest and most ardent advocates, author Mary Austin, named Death Valley “The Land of Little Rain.” In her 1903 classic, she wrote, “Out there the boundary of soul and sense is faint as a trail in a sand storm.” Coming to Death Valley in winter–the early morning road unobscured by traffic– does indeed stretch the boundaries of soul and sense, both visually and spiritually..
Death Valley’s moniker dates back to 1849 when a group of gold prospectors, seeking a cut-off route to California’s goldfields, became stranded.Two of the group struck out on foot, returning after a 26-day heroic journey to lead their fellow travelers out of the desert valley, known ever since for the near fatal tragedy that befell them there. We had left San Francisco at dawn the previous day and over-nighted in Ridgecrest. Starting out, our expectations were those of a barren terrain ahead. But, once our powers of observation took over, we found our senses overwhelmed. The silence became a companion, austere, powerful and omnipresent. By mid-day, relaxed and meditative, we approached the top of Panamint Valley where we found lonely Highway 190 and the northwest pass into Death Valley National Park.The land was declared a National Monument in 1933; then, in 1994, President Clinton signed legislation establishing Death Valley as a national park, now 3.4 million acres. As we approached a turn in the road from Route 178 to Route 190, two young coyotes watched and waited. They appeared hopeful but we knew it was best not to feed them and continued on, heading north to the oasis that is Furnace Creek where we had booked two nights at the Furnace Creek Inn. From the pass on the down slope into Stovepipe Wells, it was possible to see much of the narrow, arid valley below (6-13 mile wide x 130 miles long.) The down-grade seemed to go on forever as the Panamint Mountains rose to 11,000 feet at Telescope Peak to the south, while-to–the east—he valley floor was below sea level. Our destination for the night, Furnace Creek, fittingly describes the hottest place on the planet with normal summer temperatures reaching more than 120°F. 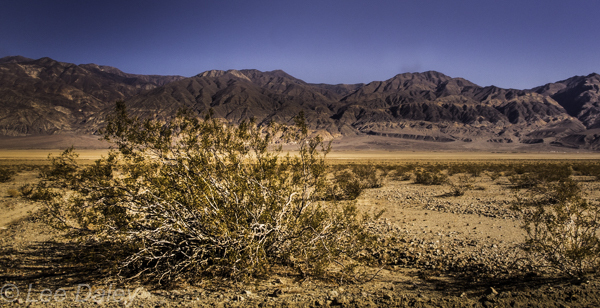 Death Valley, hotter and drier than the Sahara, set the world temperature record of 134°F in July 1913. Ground temperatures of more than 200 degrees are common.That is, of course, in summer. Fortunately, in December, the furnace was turned off and our daytime temperatures hovered around 60 degrees, with nights a cool 40-50 degrees.To our amazement, there was snow dusting the peaks of the Panamint Mountains and a lovely intermittent misty rain in the valley. Arriving in Furnace Creek mid-afternoon, the sunlight was already fading behind the surrounding mountain range.The greenery of this natural oasis stood in stark contrast to the many hues of brown, beige and pink in the desert and mountains. Life at the oasis is sustained by waters of a spring-fed creek flowing from the Amaragosa Mountains. We fully appreciated the uncommon luxury of water and greenery as we explored the inn’s grounds and gardens, before heading to dinner in the Lobby Bar with its stunning views and welcoming fireplace. Opened in 1927, the privately owned Furnace Creek Inn is very much in the spirit of other grand National Park and railroad hotels of the 1930s. Built originally with just 12 tourist rooms, the mission style inn has been updated and expanded many times in its 90 year history. The most recent addition to the resort is scheduled to begin just after wildflower season in Spring 2017, with the addition of upscale villas, spa space and a refurbished dining room, kitchen and bar. If you hope to go, the resort will close in late March-April 2017 and not reopen until late 2017 or Spring 2018. That evening, as we went to bed, we realized we weren’t the only ones appreciating Furnace Creek. 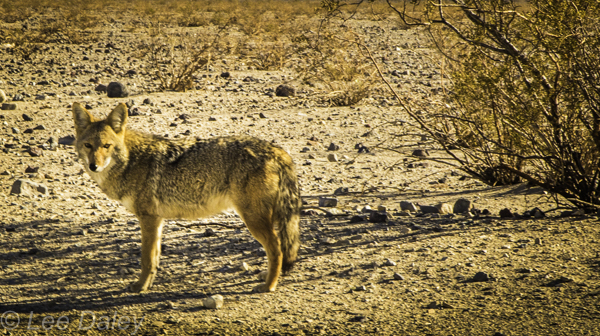 Fortunately, the local coyotes, who came by for a drink, serenaded us early and their howlingly good social hour was brief. After a peaceful night’s sleep, we awoke ready for more exploration at the valley’s Artist’s Palette and Badwater Basin. 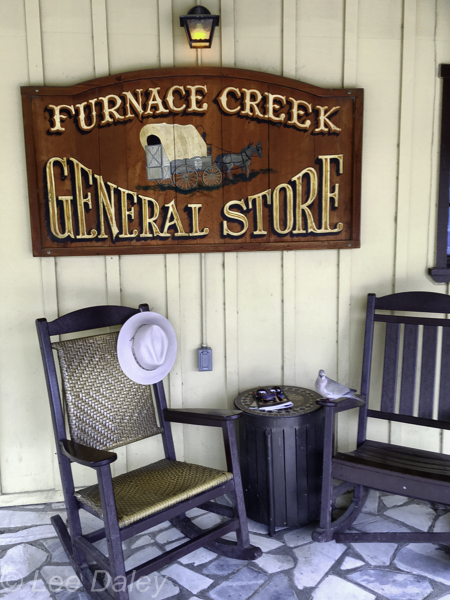 Before heading out to Badwater Basin, we explored the immediate surroundings.The Furnace Creek community originally began as an alfalfa growing ranch. Within the same area, the Furnace Creek Ranch also contains lodging, restaurants, a Visitor Center and the Borax Museum. Housed in a vintage cabin, the museum offers a glimpse into the valley’s past, from the petroglyphs of the original Native Americans to a variety of historic gold digging tools used by miners. In the museum yard, we found remarkably well preserved 16 to 20 foot- long “Twenty Mule Team” wagons, “Old Dinah” and the steam engines of the Death Valley railroad The railroad brought tourists to the resort in the 1940s via Amaragosa. Stop by the United States Post Office here. It’s a good place to send yourself a postcard from Death Valley. On this, our only full day in the valley, we explored several high points. (Although just being in the valley is really a very high point.) About 20 miles south of Furnace Creek, salt fields stretch off into the distance. Called Badwater Basin, this is the lowest place in all of North America. Attached to a cliff high overhead, a sign reads “sea level.” We craned our necks to view the sign while standing 282 feet below sea level. Annual rainfall here seldom exceeds two inches and evaporates rapidly so we were lucky to see any at all. Information signage told us that the salt left behind after evaporation is so pure it can be used for table salt. The drive around the Artist’s Palette nine-mile loop road wound through the foothills of the Amaragosa Range as it took us through deep canyons suffused with rock formations in amazing shades of brown, beige, ocher, rose, pink, lavender and green.To name a few. Late afternoon sun’s lengthening rays deepened the rock’s varied hues With few cars and people to jostle us, we were able to linger and soak up the artful natural experience. Reflective, refreshed and full of meditative oohmm, we returned for dinner at Furnace Creek Inn. An eventful day was capped by a glorious sunset and the entertaining coyote oasis Happy Hour. 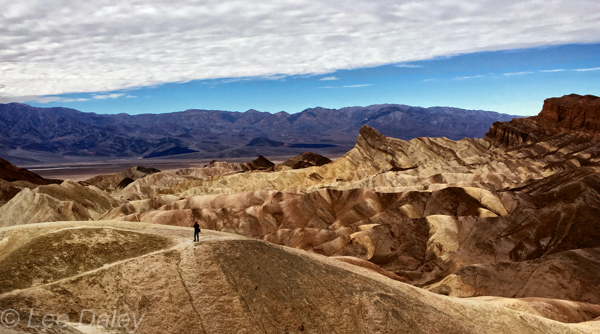 After two days in Death Valley, we reluctantly needed to travel on without seeing Devil’s Golf Course, Racetrack Playa (stones moved on the desert floor by wind and ice), Dante’s View, Eureka Valley or Mesquite Flat Sand Dunes. We’re saving those for next time. Before departure the next morning, we filled up with gas, (there are only two gas stations in all of Death Valley.) We soon found a wonderful mist falling that evaporated as fast as it fell, such that it was hard to call it rain. Disappearing before it hit the ground, I’d describe it more like a time-lapse photo. Our plan was to exit the park to the east on Hwy-190 (Death Valley Scenic Highway) into Nevada, then go south along the east side of the Amaragosa range on SR-127 to join with Hwy-58 and finally complete our loop drive at Mojave. As we drove east we had several additional treats in store. Our Death Valley journey took us near the dusty two-foot -wide Pacific Crest Trail to purifying rains near Amaragosa. Remembering all of the obscure trails we had passed; each leading into new terrain and for me, uncharted ground, I considered their possible metaphorical message; how entering a new trailhead in the right frame of mind, seeing each as one more potentially life-changing path with the possibility that it might even lead to purifying rain and possibly a personal flowering in the desert.–ohmm. 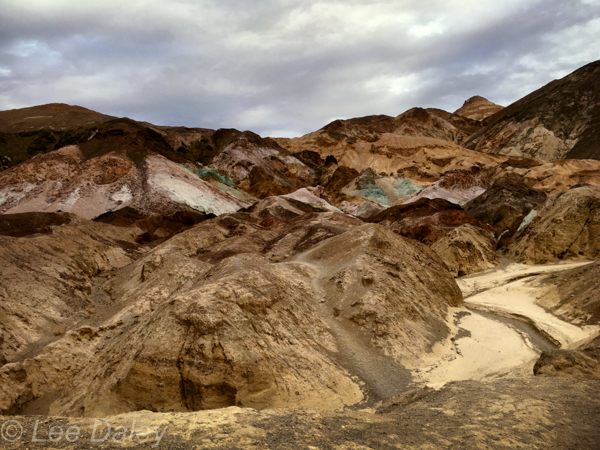 Yes, Death Valley had worked its magic. IF YOU GO: The Oasis at Death Valley, a Four-Diamond Inn: Check the Inn’s website for updates on the renovation project and for opening dates for both the inn and its sister property, The Furnace Creek Ranch. Once reopened, the inn will serve guests year-round. For more information and reservations, visit the inn’s website or call (760) 786-2345 . Both the inn and the ranch are owned by Xanterra Resorts. For travel experiences available from Xanterra Parks & Resorts and its affiliated properties, visit xanterra.com/explore. “Dining in the Desert.” The historic inn, which opened in the 1920s, has a white tablecloth dining room with a sweeping view across the valley to Telescope Peak. I’ve been told views will remain just as spectacular after the renovation. 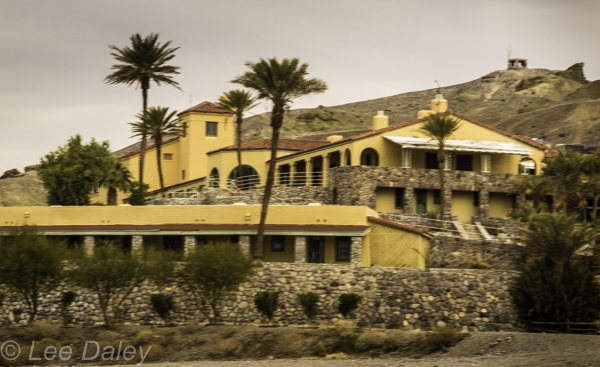 Sunday brunch at the Furnace Creek Inn, with its spectacular views, is an experience you’ll never forget. Selections from fresh fruit (mountains of berries) to made-to-order egg dishes and omelettes; everything is amazingly fresh. In mild weather, sipping a glass of Champagne on the terrace while watching the sky blaze red at sunset is another incredible experience. Likewise, after dinner in the restaurant, sit outside on the terrace and enjoy the night air under a blanket of stars. Affected by only the smallest amount of light pollution, Death Valley is the largest Dark Sky Park in the country and center stage for stargazing. If you’re a stargazer like me, this is the place you want to be for a lunar eclipse or meteor shower. Related Articles: See also the “Road to Death Valley Meditation” by John Sundsmo. Read More on California’s Deserts here:: Palm Springs Indulges the Senses.